roads | Where is @rusnivek? As ongoing operations continue for survivors of Hurricane Harvey – key messages need to be repeated as Hurricane impact turns into catastrophic inland flooding. Do not drive through flooded areas. Turn Around, Don’t Drown. I encourage all Public Information Officers / Public Affairs Officers (PIOs/PAOs) to continue to share/amplify FEMA messaging like this to all their audiences. Graphic: Turn Around, Don’t Drown. This graphic is part of the Flood Safety collection. 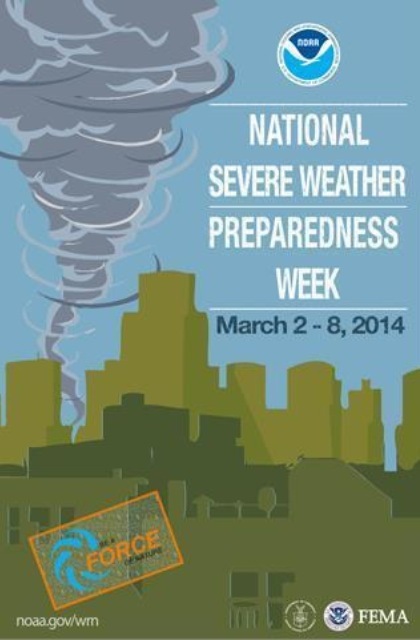 It’s 2014 National Severe Weather Awareness Week from March 2nd through March 8th. Do you have snow shovels and snow removal equipment in your emergency preparedness kit? Do you have adequate clothing and blankets to keep warm? How are the batteries in your NOAA Weather Radio so you can get immediate updates from the National Weather Service (NWS)? During severe weather, minimize your travel. If travel is necessary, always keep a disaster supplies kit in your vehicle. Snow day? Do not let kids play for long periods of time. Most everyone should stay away from the roads during severe weather. A great demonstration of why you should stay indoors by Fox29’s Steve Keeley.